Good job, I thought. They were congratulating customers for buying a pie. And not even a special pie, just the regular, conventional, in-house blueberry pie. “In-house” is a misnomer, though; those pies were shipped to us from a third-party bakerymore or less assembled but frozen, and all we did was bake and re-box them. It was around this time that the words “standards,” “excellence,” and “best” lost all meaning for me. 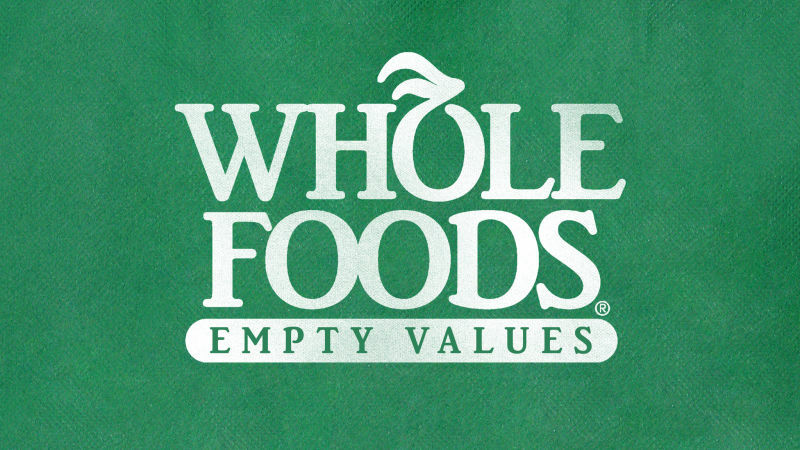 I realized the Whole Foods ethos was a farce. The most curious thing about the rhetoric smattered all over Whole Foods stores is the “we-you” positioning. Unlike other grocers, whose signage designates “we” as the company and “you” as the customer (“We offer you great food at low prices!” etc. ), the vast majority of Whole Foods signage doesn’t differentiate between the customer and the corporation. In part, this has to do with one of the Core Values that states, “We promote the health and well-being of our stakeholders…” In Whole Foods lingo, “stakeholders” means anyone who is invested in the company’s success, including (they tell us) the company, shareholders, employees, the community, the environment, and the customer. In this mindset, Whole Foods and the customer are equivalent. Whole Foods assures its customers that it’s not just the company that has high standards; it’s the customer—you are a quality person, you are better than others, you are saving the world. This is how they rope customers into paying unreasonably high prices for apples, cheese, and deli meats. Whole Foods, I came to understand, is really in the business of selling self-actualization through consumption: “With every purchase, you get peace of mind,” promises the Whole Deal catalog. The Core Value, however, that digs at me the most is: “We support Team Member happiness and excellence.” It’s a funny choice of words. Have you ever heard about Whole Foods’ high-deductible insurance plan? The deductibles added up, while I was there, to about $2,400. They gave all store employees a Personal Wellness Account card loaded with $800-1,800 to soften the blow; the number depended on our service hours. CEO John Mackey advocated for it in the Wall Street Journal, arguing that this forces employees to make more careful healthcare decisions. Sure. Which meant that, before the ACA was implemented, my $150 birth control—the only birth control my body could tolerate—would have eaten up my PWA in a matter of months. My decision was between not having money for doctor visits or not having birth control. I chose the latter. The truth: I had better healthcare options when I was unemployed and on Medicaid than as a full-time Whole Foods employee. Despite its claim, Whole Foods does not concretely support Team Member happiness. To this day, their insurance plan has not one cent of psychiatric coverage. No psychiatry, no therapy, and no inpatient treatment. This is legal. Although there’s a parity law stating that psychiatric benefits must be covered at the same rates as the rest of a company’s health coverage, that only applies to companies that initially cover psychiatric costs. According to the APA, the “vast majority” of large group insurance plans covered mental health services before the parity law existed, which means that Whole Foods is one of the very few American employers that don’t provide psychiatric benefits. When I contacted Whole Foods about this, a representative reminded me that employees decided on our health plan in 2012, and voted to include a Team Member Assistance Plan that offered five free visits with a therapist, 24/7 phone counseling (with a random operator), and referrals to low-cost mental health services (which you could refer yourself to, really). I remember that vote; we were narrowing down maybe three to five options that were pre-picked by the company, none of which were good, and none of which included mental health coverage. It was simply a mirage of “choice” and “voting” for employees. What this paltry plan means is that Team Members in crisis can’t go to an emergency room. They’ll get shunted off to a state facility. They’re forced to call a random operator instead. It also means that anyone with ongoing psychiatric needs—say, a Team Member who got a concussion on the job and needed to see a doctor about memory loss and depression, or anyone with a learning disorder—cannot viably be employed at Whole Foods. They’re selected out by the company. But if shopping at Whole Foods makes you feel better about yourself—great. I would, however, urge you to examine what, exactly, these Whole Foods values affirm, and what the company is encouraging you to identify with. There is a reason I refer to them as “rhetoric”—it’s because they’re empty. Rebecca Vipond Brink was a Team Member at Whole Foods for three years. She is currently an associate editor at The Frisky.